In Part 1, I shared Susan's story and shared Lessons 1-3. Susan was staying in a Skilled Nursing Facility (SNF) for rehab and was unsafe for discharge to home. The SNF threatened eviction once Susan's Medicare approved stay was completed. In Part 2, I shared the steps we took to fight Susan's illegal eviction and share Lessons 4-8. Today's post will cover final lessons learned, including resident rights when transferred to the hospital. SNF = Skilled Nursing Facility. Commonly called a "nursing home." Offers skilled nursing, lodging, food, and medication therapy. May offer rehab services like physical therapy, occupational therapy, and speech therapy. ALF = Assisted Living Facility. Offer long-term housing to residents who may need assistance with Activities of Daily Living (ADLs) such as bathing, dressing, eating and toileting, but do not require the level of medical or nursing care available in a SNF. RCFE = Residential Care Facility for the Elderly. These are a type of ALF, but tend to be in homes. Also known as "board and care." Room and Board= Frequently confused with "board and care" in discussions. These are group homes with multiple residents but they do NOT provide any assistance and are unsupervised. They may offer a food plan, but are otherwise just homes with multiple residents. Medi-Cal = Name of California's medicaid program. Helps provide basic insurance for those below a specific income. Medi-cal will cover long term SNF placement for residents who have specific medical needs. They will also cover "custodial" (not needing medical care) if specific criteria are met. Medicare = Medical insurance for those over 65 years old or those who qualify for Social Security Disability. Medicare does not cover long-term custodial care. Specific criteria must be met in order for Medicare to cover care in a long-term care facility. Susan lived comfortably in the nursing home for several months under Medi-Cal custodial care payment when an illness required transfer to the hospital. 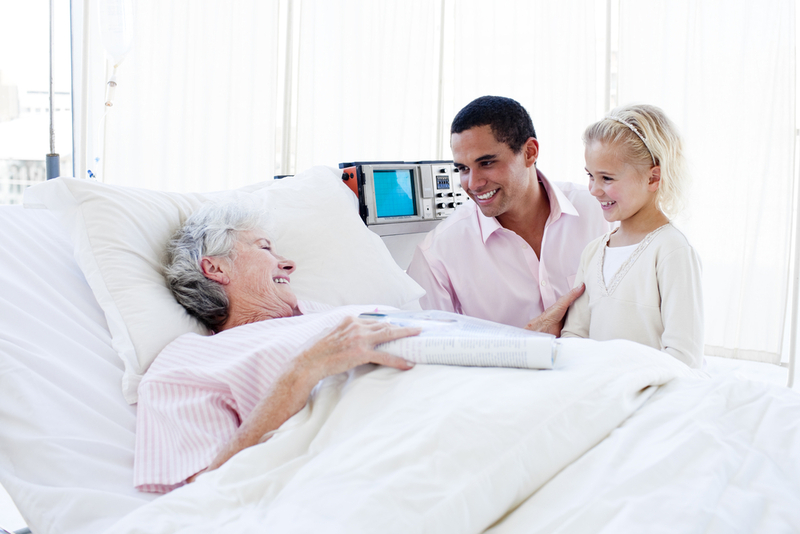 Lesson 9: Skilled Nursing Facilities are required to readmit residents within 30 days of transfer to the hospital and they are required to hold the resident's same bed if transferred to the hospital for less than 7 days. I was aware of these regulations already. We requested to sign a bed hold form at the facility. This bed hold meant that Susan's exact bed would be available to her for the next 7 days. Unfortunately, the SNF saw Susan's hospitalization as an opportunity to try to discharge Susan illegally again. They said they were not required to hold her bed and that they were not required to readmit her. When I showed them the regulations, they said that "our policy is different and we don't follow the regulations." When the hospital case worker requested transfer from the hospital to the SNF, the SNF told the hospital she was "too sick" for them to admit; when I spoke with them, they told me that she was "too healthy" to be a SNF patient. The administrator threatened the family with a Adult Protective Services (APS) referral for not "taking Susan into their home" and with a Medi-Cal fraud complaint because Susan was "too healthy." I knew APS would not agree with the SNF and that Medi-Cal was basing their decision on their review of Susan's care notes; the family was not committing fraud. These were further attempts to bully the family into moving Susan. It was clear they were manipulating the system again. We again contacted the Department of Health Care Services and filed another complaint. In this case, they recommended that we also call the Department of Public Health (DPH) so that a decision could be quickly reached as Susan would have to stay at the hospital until the complaint was investigated. DPH came to the facility immediately to investigate and informed the SNF that they were required to readmit Susan. Susan was readmitted to the SNF to her prior bed as legally required. One might wonder, why did we fight to keep Susan at this facility when they kept trying to illegally discharge her? Based on research into local nursing homes, I knew the medical care at this nursing home was excellent. I also learned that many nursing home administrations employ these unethical practices, so we were likely to encounter these same techniques elsewhere. Furthermore, my experiences with clients at nursing homes in which the majority of residents are on Medi-Cal informed me that they are not necessarily the best care homes. Lesson 10: Visit any nursing homes you are considering; know what to look for and how to research care at that home. If you don't know what to look for, hire someone who does. Once again, CANHR is a great resource for this information. The California Department of Public Health database summarizes complaints by facility name with comparison to state averages. Within a given facility, one can review specific complaints and state findings. Medicare also provides a comparison directory. Susan's story highlights just a few of the legal rights SNF residents have. Most importantly, Lesson 11: Know your rights. Some of these rights are outlined above. A summarized list of the lessons learned from Part 1 and Part 2 can be found in the next blog post. As mentioned above, CANHR is a great resource to familiarize yourself with if you or a loved one need to be admitted to a nursing home. 1) Insisting family is responsible for caring for a resident/guilt-tripping family. If you are unable to care for your family member, and they meet criteria for SNF placement, they are allowed to stay at a SNF. We would all love to be able to care for our family members within our home; sometimes this is just not possible for a variety of reasons. 2) Insisting that the SNF is unable to care for a particular resident and must be transferred to a different SNF. It's unlikely the other SNF offers anything different than the current SNF. Ask what is different and verify. Visit the offered care home to ensure it's a suitable place for your family member. If it's not, refuse the transfer. 3) Upon transitioning to Medi-Cal payment, some nursing homes insist the resident must be moved to a "Medi-Cal bed." The nursing home is only permitted to move the resident to a semi-private room from a private room. Some facilities will insist on moving a resident from a double room to a triple room; this is not permitted, if you refuse transfer. The resident must agree to the move. I recommend you evaluate the room first: is the roommate someone with whom you or your family member is comfortable living with? Things to consider: Does the new resident exhibit behaviors that will be troubling to your family member (screaming, night-time disruptive behaviors, loud tv volume)? In summary, nursing homes may try to illegally discharge a resident for a variety of reasons, most commonly because the resident is transitioning to Medi-Cal payment. Know your rights and know who to call to enforce those rights. If you're not sure or don't feel able to do this, hire a patient advocate who does know the process and who can fight for your rights. Local advocates can be found at either of the following directories: The National Association of Healthcare Advocacy or The Alliance of Healthcare Advocates. If you've experienced these practices, or others, I'd love to hear from you. Please drop me a line. I am the founder of Together Patient Advocates, LLC. I combine my past experiences as a Family Physician with my current experiences as a patient with chronic illness to provide insights into medical care patient advocacy.